Dan Thomas runs the rule over an impressive performance from Liverpool's £40 million midfielder. The Fabinho story has been quite a strange one. After a big money move from Monaco in the summer, the Brazilian international has struggled to get into the starting eleven and in the early stages of the season, even onto the bench. And when he was on the bench, he barely got onto the pitch. But after a scratchy start to his career at Liverpool, Fabinho impressed as he sat in midfield and broke up a lot of Red Star Belgrade’s attacks. While the Serbian outfit may be the weak link in our Champions League group, Fabinho’s performance was impressive and for my money (and that of others) he was the man of the match. It’s been a long route to the first team for the holding midfielder and it just shows that Jürgen Klopp is committed to getting it right for both the player and the team. Unlike other managers who want to play with all of their new toys at once (this is something that former manager Brendan Rodgers was guilty of) Klopp makes sure they are working correctly and set up before using them. It is the exact same path to a starting berth followed by Andy Robertson and Alex Oxlade-Chamberlain last season. They were not up to what Klopp required and so, weren’t played despite the fact money had been paid out for them. Big money in the case of The Ox, who cost in excess of £30m. It might seem unthinkable now that Andy Robertson only got into the first team ahead of the 2017 festive fixture list because Alberto Moreno got hurt. It took Oxlade-Chamberlain two months to feature regularly. Klopp will play the player when they are ready and not before. And so after all that waiting and a handful of appearances, it’s to Fabinho’s great credit that he was so good on only his second start. After a nervy opening with a few heavy touches and misplaced passes, he grew into the game and his ability to nip in and steal the ball made a telling contribution to the complete dominance the Reds exercised on the game. He was lucky to not get booked inside the first fifteen minutes for a slightly mistimed tackle, but every time he left his feet he seemed to win the ball. It might not be as successful in this league where he will face a better standard of player most weeks who will turn quicker and draw more fouls. But against the Serbian champions, it was very effective. I think we have been short of a mobile ball winning midfielder since Javier Mascherano (and pre-injury Lucas Leiva) and Fabinho has all the tools to be exactly what we need. He has a good range of passing and his reading of the game is excellent. That’s why he has been moved from right back to central midfield – he is good at anticipating a threat and breaking up play. It is important to contextualise the performance because last night’s visitors are far from the most potent attacking threat we will face this season. But Fabinho has had his chance to stake a claim for start and he has taken it with both hands. With Cardiff City the weekend’s visitors to Anfield, it’s likely that he will be handed another start as Jordan Henderson will likely not be risked and that match will come too early for fellow hamstring victim Naby Keita. The Brazilian has earned it with such a confident performance that put his team on the front foot. Fabinho’s ability to win the ball back and move it on allowed us to play most of the match on the attack. We would have done that anyway because Red Star were happy for us to have the ball but when you break up play, you leave your opposition vulnerable on the counter because players are out of position having taken up attacking positions. 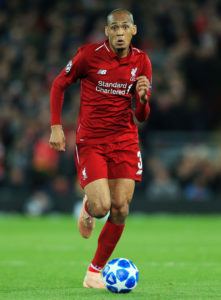 Getting through a full 90 minutes will help Fabinho no end in terms of fitness and confidence and hopefully he will look back at that match as the one that was the springboard for him to start his Liverpool career.